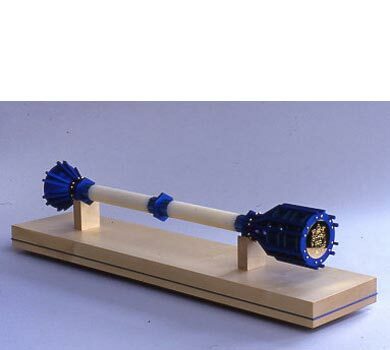 When the Polytechnic commissioned their mace, one of the governors also happened to be chairman of IMI. The Polytechnic enjoyed significant links with this international company whose head office was opposite the main campus. Indeed, it was IMI’s research labs that had liased with Gerald Whiles in the early 60s to investigate the decorative potential of their titanium. It was readily accepted that titanium would be an appropriate material for the mace though the design included nylon, acrylic and gilded elements. The titanium, supplied of course by IMI, was milled and lathe-turned from thick section sheet. Colouring was ‘interesting’ as, in addition to the easily obtained blues and purple, I wanted to feature a zingy yellow-green within the head of the mace. This was extremely difficult to achieve consistently across all the pieces. Many rectifier fuses were blown and I could not have done it without use of that wonderfully lethal etchant, which is now banned, certainly from my institution; a mix of nitric and hydrofluoric acids!